Here’s an updated version of my previous post showing the Facebook banner size in exact pixels. Looks like it’s changed but not by much. 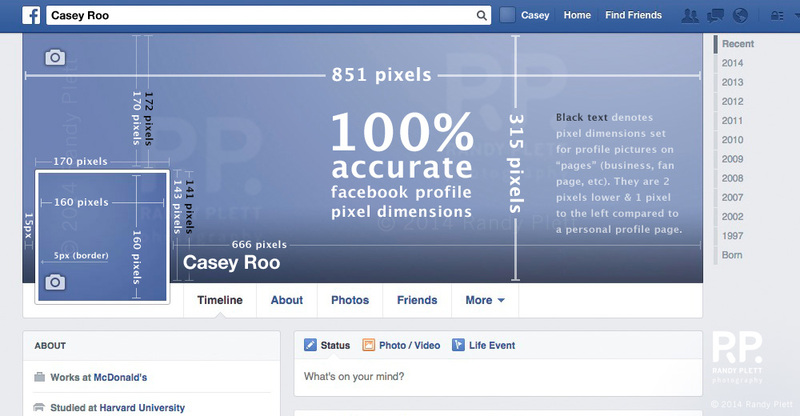 The Facebook banner dimensions are still 851 x 315 pixels. This is based on the website code, but not in the actual pixel layout seen on screen grabs viewed at 800% in Photoshop. Those dimensions are actually 851 x 313 px. (notice how the vertical dimensions add up to 313; 170 + 143?). It can get a little confusing, so I did some tests to ensure accuracy. Uploading an image that is 851 x 313 px will actually be upsampled and lead to a loss in quality. So don’t do that. Only use those dimensions if you are designing a layout in PS or building a template. Uploading an image that is 851 x 315 px will be much better, and you will hardly notice compression artifacts except with certain colours that may look dull or downright ugly. Uploading an image that is 1702 x 630 px appears to slightly degrade image quality and is only necessary if you plan to adjust it later on. After looking at the results at 500% in PS it looks like there is a subtle loss of detail and increased compression artifacts in the rendition of the larger 1702 x 630 px image, possibly due to a Facebook processing algorithm. It seems that the native size looks slightly more accurate. But again, this is at 500% and there isn’t really a perceivable difference. The benefit of uploading a slightly larger image size means you’ll have a bit more flexibility with scaling and cropping. However, if you are dealing with small text or graphics, you may wish to stick with the native size. I made an animated gif that shows how the 1702 x 630 px file degrades image quality and makes small text less legible. Most noticeable is the shift that occurs on the larger version, and if you look closely at the really small text, it looks a lot cleaner in the image uploaded in the native resolution. Personally, I’m now much more inclined to upload files at the native resolution. Now on “pages” it looks like the profile picture is still at 160² px but it is two pixels lower and one pixel to the left when compared to the personal profile page. Not much of a difference, and certainly much less different than the previous pages design. Lastly, Casey Roo is the name of my cat, in case anyone was wondering.